Habitat : It is found in western himalayas from kashmir and kumaun at altitudes of 2,000-4,500m. Uses : Root yields red color commercial dye, mainly used for coloring foodstuffs, wools, oils and medicinal preparations. Also, used in the treatment of wounds, pain relief, fevers, infectious diseases, bites and stings. 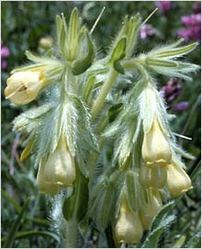 Flowers are used as stimulant and cardiac tonic. Bruised roots of ratanjot are applied externally to cutaneous eruptions.